Cheltenham Gold Cup hero Sizing John's owners Alan and Ann Potts made their mark at the Goffs UK Aintree Sale on Thursday as Tom Malone went to £300,000 on their behalf to secure winning pointer Madison To Monroe, a strikingly marked roan gelding. Offered by leading point-to-point handler Colin Bowe, the four-year-old son of Presenting was an impressive eight-length winner between the flags at Monksgrange last month. Out of the winning Traditionally mare Caltra Princess, he is from the family of Group 3 winner Miracle Of Medinah. Malone said: "He's a horse who I thought we'd best have a go at. He's a very unusually coloured horse but I've been lucky with Presenting, as a lot of people have. He was very impressive on his debut and the word was that he was good before he even arrived on a racecourse. "The race was sub-six minutes so he has to have a lot of pace. He's a four-year-old maiden winner who won first time out and you have to expect to have to pay money for them these days. I hope he's lucky for the Potts'." Malone was intrigued by Madison To Monroe's Flat-oriented pedigree. "Maybe the Flat side of his pedigree is where he gets his speed from and it hasn't stopped him in his first run," he said. "He's a big, strong horse but I like that more when big horses can show it first time out as four-year-olds and shows that the ability is there. Normally you've got to wait until they're five- or six-year-olds." A trainer has yet to be decided for the Potts' new acquisition. 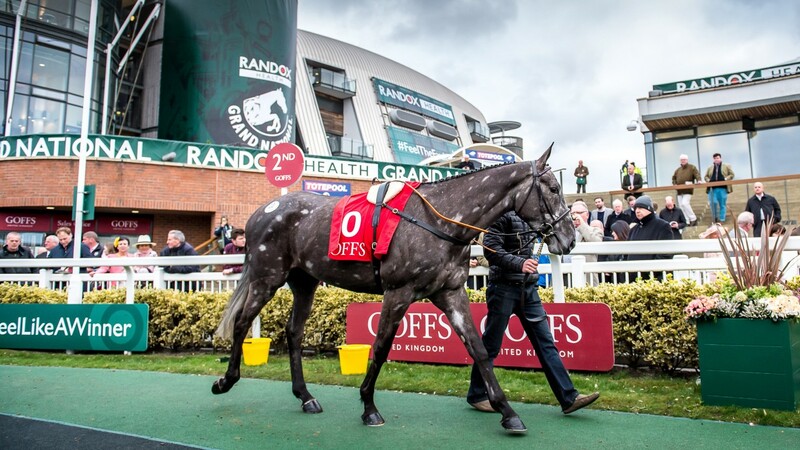 Held after the first day of racing on Aintree's hallowed turf, this was the second year that Goffs UK staged the sale in the winner's enclosure. The inaugural auction recorded half a dozen six-figure lots but this time there were seven. Saturday's Randox Health Grand National entry Just A Par, the first lot in the ring, was bought by his trainer Paul Nicholls for David and Patricia Thompson of Cheveley Park Stud in Newmarket for £100,000. A ten-year-old son of Island House, he was last seen winning a veterans' handicap chase at Newbury and has previous experience of the Grand National course having finished 15th behind Rule The World last year. "He's been bought by the Thompsons and he's going to carry the colours of their son Richard in the National,” Nicholls said. “It's ideal the horse is staying in the yard and Harry Cobden keeps the ride. He's in good shape, he won the other day and the drying ground will help him." David and Patricia Thompson struck in the Aintree spectacular 25 years ago with Party Politics, who they purchased days before his victory. Just A Par joins Highland Lodge and Le Mercurey as part of the Thompson string that will line up in the race on Saturday. Anthony Bromley of Highflyer Bloodstock was another of the agents to break the six-figure barrier when signing for Some Man at £165,000 and Kupatana at £120,000 on behalf of owners Stuart Parkin and Mike Grech. The duo have a host of horses in their ownership including exciting novice hurdlers Lough Derg Spirit and River Wylde. A four-year-old son of Beat Hollow, Some Man had been successful in a Portrush point-to-point for Donnchadh Doyle last month. He boasts a classy jumps pedigree as his dam, the unraced Presenting mare Miss Denman, is a sister to Paul Nicholls' Cheltenham Gold Cup hero Denman. Aidan Fitzgerald's Kupatana, a four-year-old daughter of Westerner, landed a Monksgrange point last month. Bromley said: "Stuart and Mike have been good supporters of these sales and Irish pointers over the last couple of years. Constantine Bay is another of their horses who they bought at this sale last year for £40,000 and he's favourite for the three-mile Grade 1 on Friday. "Some Man is going to be trained by Paul Nicholls - there's the Denman connection there, which is quite interesting. "Kupatana was a very impressive performer when she won in a really good time. I really like the mare, a really strong, masculine daughter of Westerner and she'll be trained by Nicky Henderson." British point-to-point trainer Tom Lacey enjoyed more success in the ring on Thursday when his only lot, Blackbow, was bought by Harold Kirk and Willie Mullins for £150,000. The four-year-old son of Stowaway landed a Maisemore Park point-to-point late last month on his debut. Mullins said: "We're very lucky with the sire and I like horses out of Accordion mares, and he's just a fine stamp of a horse. Grass is the next thing for him and I'll imagine he'll go down the bumper route next season, but he looks like a chaser in the making." Lacey was thrilled and added: "I'm over the moon. The horse pulled hard when he won his race and to go on and win like he did was very impressive." Gearoid Costelloe went to £135,000 to secure Locker Room Talk, a placed son of Beneficial, who will join Rebecca Curtis's, yard while Randox Health founder and owner Peter FitzGerald was a new face to the buying ranks when David Minton secured Royal Rendezvous for £130,000 on his behalf. A five-year-old son of King's Theatre, he was successful in a three-mile point at Castletown on Sunday. Overall figures for the auction saw 18 lots sell for turnover of £1,813,000, down 16 per cent from last year's figure of £2,170,000. The average fell three per cent to £100,722 from £103,333 but the median improved 23 per cent to £86,000 from £70,000.